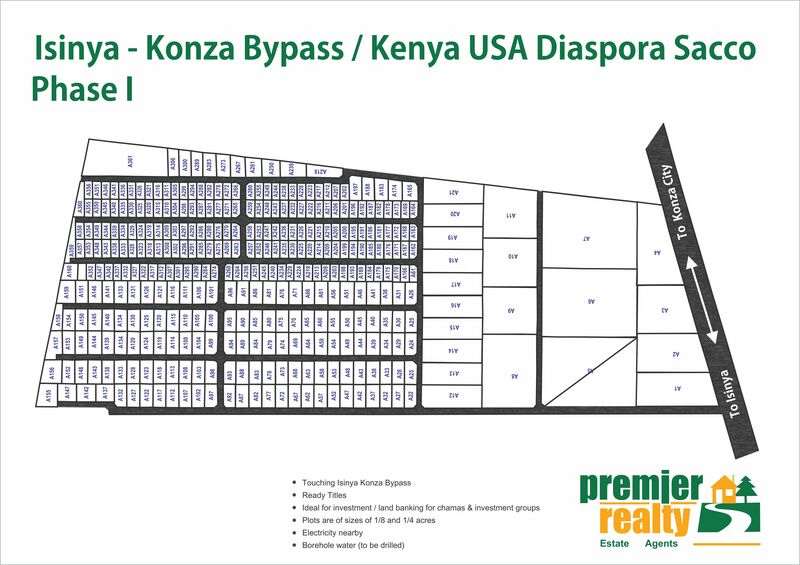 After an extremely successful sale of Phase I plots and owing to more demand by members, Premier Realty and Kenya USA Diaspora Sacco has entered into a new strategic partnership joining hands to provide Kenyans in the USA Diaspora an opportunity to own the Isinya-Konza Phase II plots at a cost below the market prices. This new 75 Acres of land is located directly opposite the Phase I land project of the Sacco, in Kajiado County and touches the proposed Isinya/Konza Bypass. It's also situated 16KM from Isinya Town and 16KM from Konza ICT City. Given its location, the on-going developments of Konza ICT City, and the upcoming nearby developments, Isinya/Konza Phase II property has great potential that will see its value increase rapidly in the coming years. Recent reports from estate agents indicate that the attention of land investors has shifted from Nairobi to satellite towns and environs such as Kitengela, Isinya, Syokimau and Athi River. It is thus not in doubt that investing in property that is within a few miles of Konza City is a very worthwhile venture. Nothing could be more prudent than buying now into property that is set to almost quadruple in value in less than four years' time. 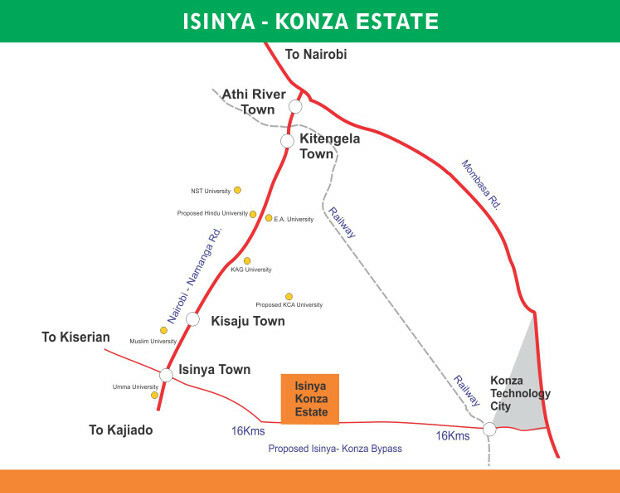 Isinya/Konza Phase II is sub-divided into 1/4 acre (100x100) and 1/8 acre (50x100) plots with clean and ready Titles. Approximately 350 plots are remaining for you to buy. Existing Infrastructure: Internal roads are graded to murram. Electricity is nearby. Borehole water to be drilled. 1/8 acre plot: currently valued at KES 500,000. What do I need to purchase a plot in Isinya/Konza Bypass estate? Download the plot map and list of available plots. Make your selection. **If you are a group ready to join the Sacco, you are also invited to purchase the plots as a group. How do I select a plot ? You may call the Sacco office on 1-678-398-7728 and ask for assistance in plot selection and if you've already made your selection, call the office with your details to pay $25 plot booking fee. You will then be advised on the next steps with your plot purchase. 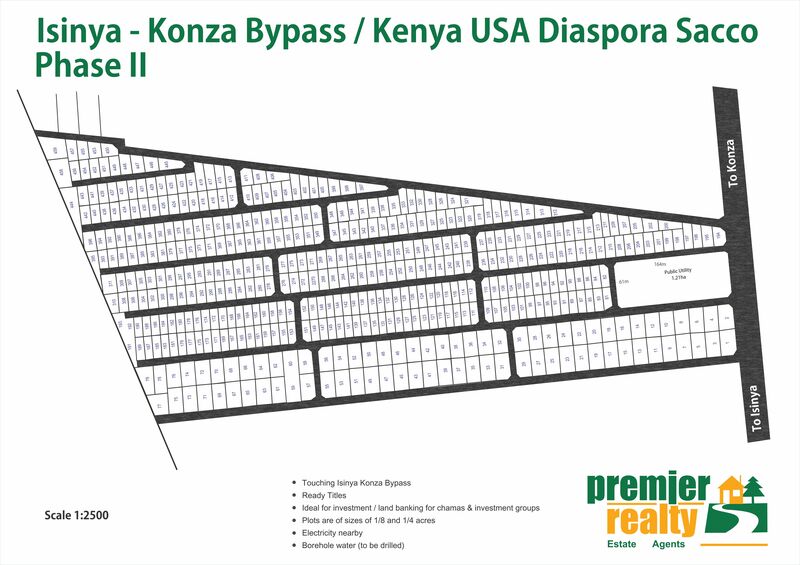 Did you miss out on purchasing Isinya/Konza Phase I plots? We still have a few remaining for your selection. How much will I need to pay before I get my title? If you're paying CASH or using the 1-month to 10-month instalment option, the tables below summarizes all the monies you will need to pay before your title is processed i.e the legal fees, stamp duty and costs associated with transfer of the title into your name. Title processing period will depend on how soon you complete your payment, submit the necessary documents, sign the sales agreements etc. It can take anywhere between 1-3 months to get your title. Once the title is ready, the Sacco delivers it to your doorstep in the United States or as per your request. Can I purchase the plot using a Sacco loan? Absolutely YES! The Sacco is offering up to 100% financing on the cost of the land. The cost of land using a loan is KES 375,000 for 1/8 acre and KES 750,000 for 1/4 plot respectively. The loan amount will be based on how much you have in your Sacco savings or upto x3 your Sacco savings. Your plot will serve as the collateral for the loan. * Note the above fees apply ONLY if borrowing towards these plots. For all other Sacco loans, different terms & fees apply. This is your chance to own a piece of land near Konza Techno City! "How better can it get? ! My 4 Title Deeds just delivered to my door! Meanwhile, I am still battling to get my Title Deeds from NSSF for properties I had bought many years ago before these ones! My diaspora friends, if this is not cause for you to join the Kenya USA Diaspora Sacco, then I don't know what is!